My progress on my Pieced Hexie quilt is coming along......this month I am Queen Bee in the Get Your Hex on Quilting Bee. 4 blocks are back from the busy bees...the bow tie and baseball near the bottom right corner came all the way from Switzerland! ( I kinda name them, silly I know). Every time I finish a block I have a new favorite. You can see the rest on my Flickr page and check out our group too. So many talented ladies, I can't wait to see what's in store for us next month. I did get some more basting done this weekend and it will take me all week to sew these 2 inch babies together. I love my mini design board from Lori Holt's tutorial, it's so easy to carry around and the pieces don't get mixed up or fall off. It does catch A LOT of thread....not so pretty in the pictures, but I still love it. I will say don't iron on it cuz I scorched my other one duh! Iron too hot!! Those hexies are adorable! & I love the mini design wall idea- brilliant! Thanks Kate, I can't take credit for the design board but I do love it too! All those hexies are so cute! The mini design board is great, thanks for linking to the tutorial! Thank you for linking up to Let's Get Acquainted this week! Thanks Taryn for hosting this week glad you had the time to stop by!! 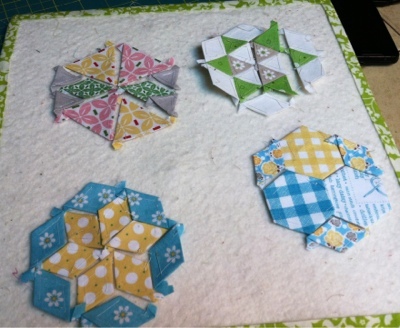 Love seeing your hexies- very pretty! Thank you Beth! Glad you stopped by for a visit! Your hexies are just beautiful! I keep thinking that I should make one of the design boards. They are pretty and useful! Love those pieced hexies. I would love to give them a go but I really don't think my patience would extend far enough! Sue you can do it! 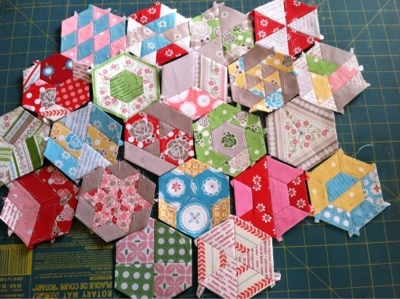 Stop by Hillbilly Handiworks blog and check out her pieced hexies.... You can buy the paper pieces by the set and flow along with a group on Flickr. Totally love those hexies, but what a lot of work. You are dedicated! Jessica I agree it's a lot of dedication but with my bee mates it will be much easier. Thanks for stopping by my blog! This is a really cheery hexi quilt - so much EPP! I have been eyeing some EPP for myself. Your little tuturial on EPP is very helpful and is giving me the push to want to cut some hexis out and start with some fabric I think would look pretty cute. Lovely blog and lovely EPP - will definitely be following in the future! Thank you for stopping by my blog! You should definitely try the EPP, it is so addicting and a small project is totally manageable. I did a cosmetic bag with a 12x19 piece in Flirt and I love it. Lovely little hexies! :) I have been wanting to learn how to make/piece hexies.. there are so many things I want to learn, though, we'll see when I actually get to it! That's going to be a fantastic quilt! These are amazing! I have never seen anything like this. I need to check out your Flickr group! Hi Kristin, Love your hexies!! Do you piece them by hand? Your hexies have blown me away. They are beyond fabulous. hey thanks for the comment on my blog! i just started doing linky parties and it's fun to see what everyone is up to. i am AMAZED by your little hexies! WOW your hard work is paying off . . it's going to be gorgeous! Your hexies are beautiful - I've seen some popping up in the Flickr groups! omg! I have hexagons that I need to learn to do something with. I can't imagine working with them in such small pieces like you have! your Pieced Hexie quil is starting to look stunning!! Love it! What an intricate work! Please post a picture once you're finished, the final result is going to be awsome! Adorable - love the pieced hexies!! What a beautiful quilt it will be! Those tiny pieced hexies are the awesomest!!!!!!!!! !